Hide Page Title WordPress Plugins provide functionality to hide the title of a page/post on a WordPress website. First of all, let us know a little about the title tag. A title is nothing, but the name of the page. It is kind of ‘mandatory’ because of many programming aspects. So, it’s our choice whether to avoid writing it or we could just follow the standard and title our page. After that, we can easily hide it using the plugins. If you don’t want your Home Page to be titled as ‘Home’ or if you want to hide the title, you can simply use this awesome plugin. You can turn the title tag on/off and in addition, the plugin will also allow you to toggle the title’s visibility at any instant. So, from this point forward we are going to need a Hide Title WordPress Plugin for our website. As of now finally, we know about the Hide Page Title WordPress Plugins. The Title Remover WordPress Plugin is a FREE of cost plugin. The plugins functionalities don’t affect the menus or post tables in the admin area. Checkboxes displayed in the post creation form. Displays checkboxes in the post creation form to hide the title. A meta-box contain the checkbox for the purpose to hide the title for all post types. The Genesis is one of the Hide Page Title WordPress Plugins. It easily lets you remove the page title from a specific page. If you don’t want to show the title of any page then use the easiest way. Edit the page and don’t forget to check the ‘Hide’ checkbox. 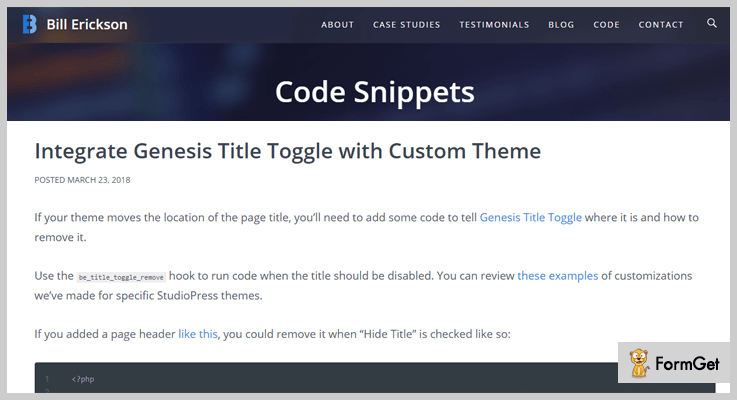 The Genesis Hide Title WordPress Plugin only works with Genesis theme. The Genesis Title Toggle WordPress Plugins is another FREE plugin instead. The plugin allows you to toggle the visibility of a page title. You can also set the sitewide defaults. Set the desired functionality in a single click. Title Toggle is a Hide Page Title WordPress Plugin. This WordPress Plugin allows hiding the title of any page or post. Just by following few simple steps you will get the title toggle functionality on your website. Login to your WordPress website’s dashboard. Select a page or post. Choose the option to edit the page or post. Scroll the page until it reaches the meta-box containing the title and toggle checkbox. Check the ‘Hide Title’ and update. Refresh the updated page, to cross-check the title is successfully removed. The Title Toggle Hide Page Title WordPress Plugin will only work for the Storefront theme. 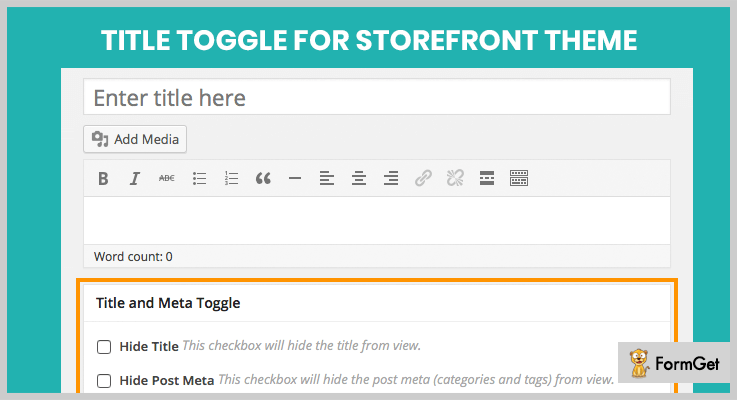 The Title Toggle for Storefront Theme Hide Page Title WordPress Plugin is a FREE of cost plugin. Toggle the effect of show/hide the title of any post. Toggle the effect of show/hide the title of any page. Use of meta-box for every post/page. Checkboxes for toggle hide/show functionality. 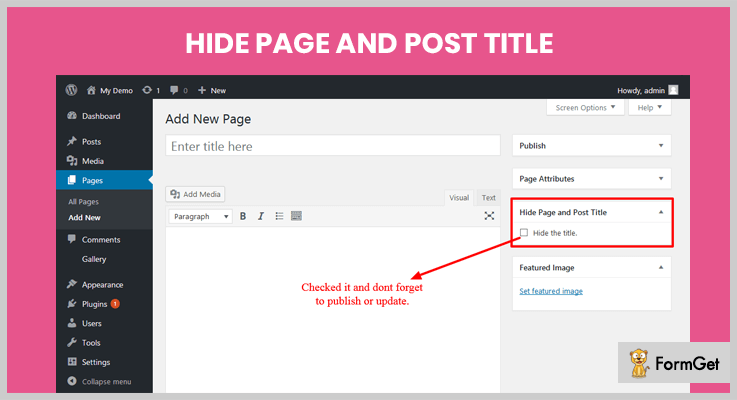 Hide Page And Post WordPress Plugin provides you with a functionality to hide the title of pages and posts. It allows you to hide the visibility of custom posts and pages too. 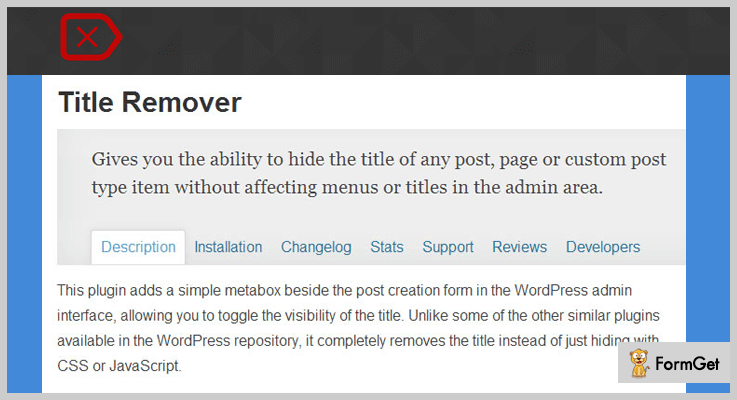 The Hide Page And Post WordPress Plugin is another FREE plugin. Title of a specific page can easily be hidden. The title of a specific post can be hidden easily. Hide the title of any custom post. AMS Hide Page and Post Title WordPress Plugin is a very simple and easy-to-use plugin. Especially recommended for beginners. The plugin allows authors of the website to hide the title tag. After the successful installation of the plugin. The edit post screen for the post and pages will contain an option to select the title’s visibility on a page/post. 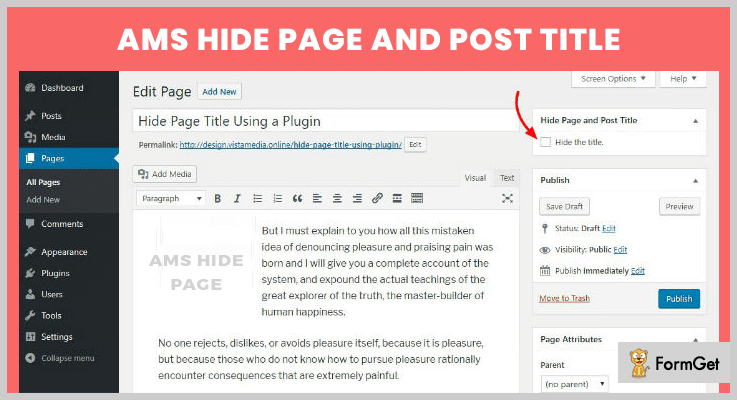 The AMS Hide Page And Post Title WordPress Plugin is a FREE plugin. Use the WordPress built-in interfaces. Hide the title tag on a single post or page with ease. The Hide Page WordPress Plugins could be of great help in hiding the title of a webpage or blog. The above listed Free WordPress plugins are the highly recommended plugin for the Hide Title purpose on a WordPress Website. These listings are not just on the top but are a result of most used and tested by 1.50k users. The performance is proven best in a lot of standards consequently these were the best in conclusion. If you are having anything relevant to the topic or are having any trouble understanding any section, do comment below!